For more than 40 years, the striped bass population in Lake Hartwell has been maintained by stocking small fish into the lake each spring. Given enough time and “groceries,” these striped bass can reach weights of 40 lb or more. However, over the last few years, Lake Hartwell anglers have expressed concern about the declining numbers of striped bass in the lake. Due to low oxygen levels last September, fisheries biologists from both the Georgia Department of Natural Resources’ Wildlife Resources Division and the South Carolina Department of Natural Resources documented a major die-off of striped bass. How Do You Study Striped Bass? To determine how striped bass in Lake Hartwell respond to harsh summertime conditions when thes low oxygen levels occur, DNR biologists are surgically-implanting small radio transmitters into 40 striped bass this winter, and will track their movements for the next 12 to 36 months. What do anglers need to know? It might be possible that some anglers will catch one of these striped bass that has an internal transmitter. If you catch a striped bass with a 3-inch long filament protruding from its belly, the DNR encourages you to report the TAG NUMBER by calling (888) 824-7472 and to release the fish alive, if possible, so we can continue to track the fish. If the fish is harvested, instructions will be provided on how to return the transmitter. This project would not be possible without the combined efforts of both state DNRs, and the support of the US Army Corps of Engineers. 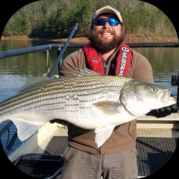 For more information about the Lake Hartwell Striped Bass Telemetry Project, contact the Project Leader, Anthony Rabern, at (706) 947-1507.